It has become increasingly clear that the Trump campaign, and subsequent administration, were in contact with Russia. We have all US Intel agencies asserting that Russia did in fact use a network of 1000+ operatives to influence the 2016 US Presidential Election. We have allegations of pay offs, pay outs, off the record loans from Russian financiers and allegations that POTUS was actually compromised by Russia who then leveraged that information to force POTUS to push a pro Russia agenda. We do know that the contact with Russia happened. We do know that the White House attempted to enlist the FBI to influence media reports on the Russian contacts. We do know that the White House has banned major news media outlets that reported on this accurately from attending press briefings while allowing fringe media outlets that only regurgitate the administration’s narrative to attend. We do know that the White House went directly to the heads of the Congressional Investigative committees and successfully enlisted them to contact the news media to quash the story and push the administration’s narrative. It is time for an independent investigation. A 9/11 Commission style investigation and a Watergate style special prosecutor. Below are the members of Congress who are responsible for pushing an investigation of Trump and Russia. Send them a postcard and call them every single day telling them that you want them to go forward, ignore the POTUS attempts to bury the information, and call for an independent investigation. Everyday until they do it. …and please go to your MOC’s local Town Hall Meetings and ask them about this. Wear a strip of tape across the back of your shirt, with your zip code written on it, and the phrase “Not Paid to Be Here. I am a constituent from [your zip code]. This helps hammer home the message that they work for you, and it helps turn back the talking point that Towhn Hall Attendees are professional agitators. You can find out where and when your Town Hall meetings are here. (Introduce yourself). I want an independent investigation of Trump-Russia ties and a special prosecutor immediately. Note: He’s not on the committee this time but I thought it would be poetic justice if he was buried under voter requests. Your decision if you want to add him. The germination of this idea comes from our Facebook follower Crystal R.
You can amplify this message and help makes this the largest Postcard Avalanche to date by sharing this far and wide across all platforms. For more tools to wage democracy check us out at resistancetoolbox.com, you can also find us on Facebook and follow us on Twitter. Donald Trump is a threat to the American people and everything we believe in. Millions are rising up in resistance, but too many Democrats have been enabling and collaborating with him instead. Why threaten to primary Democrats? The next crucial step is escalating our demands, and demonstrating that we won’t accept anything less than full opposition—by showing Democrats just how many people are willing to back primary challenges to Democratic collaborators and enablers of Trump. Democrats must know there is a price for collaborating with Trump. Any Democrats who would give legitimacy or support to Trump do not represent us and must be replaced by people who will stand up for our lives, our values, and our democracy. Add your name. What does it mean to fight Trump? Democrats have a lot of power to stop Trump’s agenda—if they choose to use it. If Democrats decided to fight, they could use Congressional rules of order to grind business as usual to a halt to stop the unconstitutional Muslim ban, fight the theft of a Supreme Court nomination, and demand Steve Bannon be fired, for instance. Instead, many Democrats seem to be operating under the delusional assumption that if they play nice with Trump, he’ll magically become more reasonable. That kind of logic just results in us losing more ground every day—and it’s why we need to hold Democrats’ feet to the fire. How will you decide who to primary? The short answer is that we’ll identify where we think we can make the biggest impact, and take direction from the growing resistance movement (including by surveying the people who sign up here.) This is a grassroots project, but there’s no limit on how big we’ll go if the support is there. In the best case scenario, this pledge becomes a tool that successfully pushes Democrats to fight Trump harder. The goal is not (necessarily) to primary every Democrat in Congress, but to make the Democrats who are there do what we’re asking them to do: fight Trump with all they’ve got. In other words, the most effective threat is one you don’t have to follow through on. We’re a group of organizers and activists who have helped to build both mass movements and large-scale electoral programs. Many of us were involved in the Bernie campaign in 2016, and we saw what an army of small-dollar donors and volunteers can do when they commit themselves to something important. We believe in people power, and we’re committed to helping translate the energy we’ve all seen in the streets since Trump took office into an electoral force capable of winning—starting in the primaries by defeating Democratic incumbents who are failing us. The Rose Resistance is a national movement dedicated to advocating for freedom, equality, and democracy – American values currently under siege. We are committed to nonviolent resistance through information, advocacy, and physical presence. On a national level, we provide information to counter Trump propaganda. On a local level, we organize in our cities and communities to help protect the people most endangered by the Trump regime. Get involved. Your country needs you. The Rose Resistance began in LA on the evening of November 8th and spread across the nation within a few days. Our organization is dedicated to advocating for freedom, equality, and democracy – American values currently under siege. This group welcomes people across the political spectrum who are ready to fight fascism and white supremacy. The Rose Resistance is committed to nonviolent resistance through information, advocacy, and physical presence. On a national level, we provide information to counter Trump propaganda. On a local level, we organize in our cities and communities to help protect the people most endangered by the Trump regime. Our name is inspired by the White Rose, a nonviolent, intellectual resistance movement against the Nazis, founded by students in Munich in 1942. The White Rose stood for truth in the face of lies, bravery against the worst odds, and the duty of good people to stand up for each other. The motto of authoritarianism is, “It can’t happen here.” We have a ten-year head start on the White Rose. We are organizing before it is too late. Because it can happen here – unless we stop it. The Rose Resistance provides Action Agenda To Do Lists, issues education and has regional chapters that you can join. 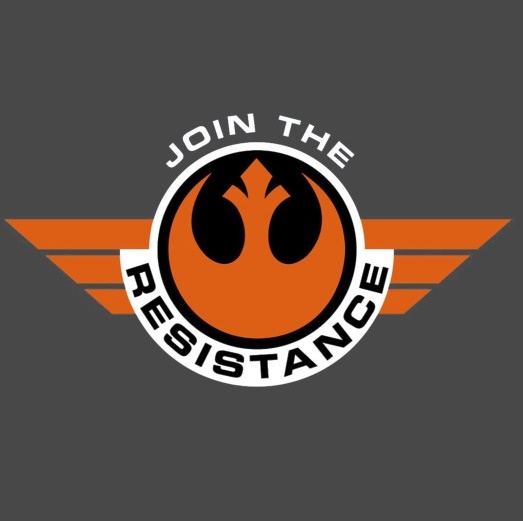 Join the Rose Resistance here.